Terry Kovalcik, this semester’s Allison B. Allen artist-in-residence, exhibits his metal clay jewelry. 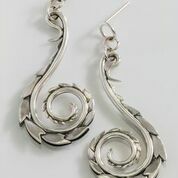 Metal clay forms like clay, but when fired, becomes metal–silver, copper, bronze. Terry’s jewelry speaks of his deep curiosity about the world around him and his years as an illustrator influence his technique and approaches to the subject. Artist Talk and Reception: March 2 at 5:00 p.m.